Nominated for "Best Actress in Leading Role" at the 1967 Academy Awards for "Wait Until Dark", Audrey Hepburn always dazzled at the Oscars with her classic and feminine style. Although she didn't bring home the coveted golden statue (the award went to the other Hepburn, Katherine), Audrey Hepburn looked impeccable in her Oscar ensemble. 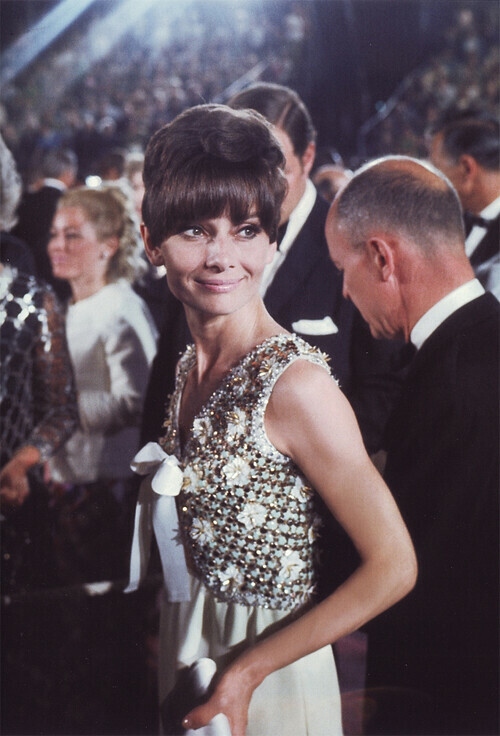 At the 1967 Academy Awards, Audrey Hepburn wore a two piece ensemble designed by Gubert De Givenchy. It consisted of a sparkling vest with white flower embellishments that allowed a peek at Audrey Hepburn's navel. A giant white bow tied at the vest that was decorative enough so Audrey could forego a necklace. The vest was accompanied by a long, floor grazing white skirt that was very slim in cut. What a beautiful image. Thanks for sharing. Audrey is just so timeless. What grace! She's so beautiful wearing White Suit.